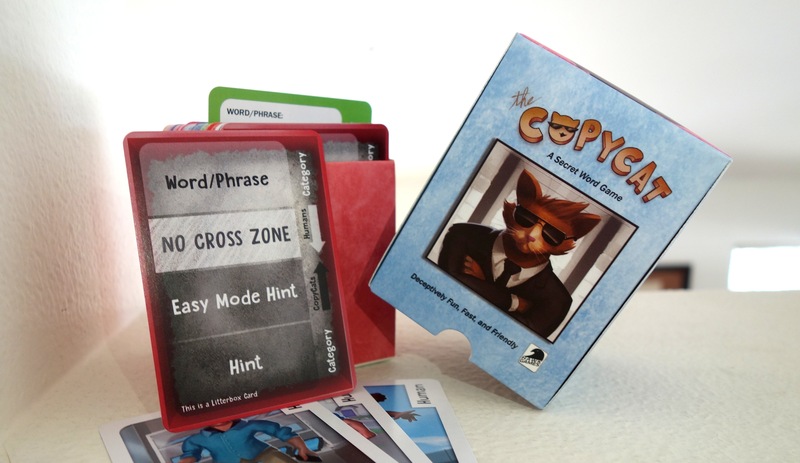 The CopyCat is a word-based, hidden-identity psychology card game. Players secretly assigned the CopyCat role must pretend they know the word or phrase that everyone else carefully describes based on hints and descriptions, while the other players try to identify and eliminate the pesky CopyCats! Can you sniff out the CopyCat in your crowd? Objective/How To Win: Humans win when all CopyCats are eliminated by end of game. CopyCats win when at least 1 CopyCat is not eliminated by end of game. 2) Randomly pass out the Identity Cards facedown. Look at your card, but do not reveal it to other players. 1) Select 1-2 Litterbox Cards (based on the number of players), and put them on a table faced down. Litterbox Cards have a yellow card back. 2) Select 1-2 Topic Cards (based on the number of players), and put them on top of the Litterbox Cards so that the Topic Cards are completely covering the Litterbox Cards. Topic Cards have blue card backs. DO NOT look at the words on the Topic Card. 3) Flip the Litterbox and Topic Cards around so they looks like this, with Topic Card underneath the Litterbox Card. 4) Each player takes turns secretly sliding the Litterbox Card up/down depending on their role (don’t show others which way you slide it!). If you’re a Human, you only move the Litterbox down to reveal the Topic word/phrase. If you’re a CopyCat, move the Litterbox Card up to reveal up to two hints (if playing with more than 1 Topic Card, CopyCats may reveal hints for up to 2 Topic Cards). Reveal additional Hint for Easy Mode. 5) Pass it to the next player after you are done looking at the Topic or Hint(s). 6) Repeat steps 5-6 until everyone has had a chance to see either the word/phrase or the hint(s). * It is recommended that players who are Cats DO NOT say the hints as their description. The hints are designed to not be directly related to the Word. Cats should try to describe the Hints as if they are the Word or combine other players’ hints with the Hints. 1) All Players then discuss and vote on who to eliminate for Round 1. You may choose to limit discussion time (ie. 2 minutes). 2) After discussion, on the count of 3, everyone points to who they want to eliminate. Player with the most votes will be eliminated. You may not delay in pointing, or else your vote is disqualified. * If there’s a tie during elimination (applies to round 2 as well), players will vote again. If a second tie occurs, then no one is eliminated. Players lose an elimination opportunity. * Once players are eliminated, they will reveal their role card. * “9 Lives” is only activated with 4-6 or 9-10 players. Once a CopyCat is eliminated, the eliminated CopyCat may guess what the Topic word/phrase is immediately. Upon a correct guess, the CopyCats automatically win without further play. Upon a wrong guess, the game proceeds if there are more eliminations to go. If the last CopyCat is eliminated, then the Humans win. Essentially, “9 Lives” can be activated by all CopyCats. For Round 2, everyone describes the Topic word/phrase again using different descriptions. Then vote on elimination(s) for Round 2. *When playing with more than 8 players, 2 Topic Cards are in play. The Humans must select 1 Topic Card to look at while The CopyCats can look at the Hints on both Topic Cards. Essentially, The Humans will be split into 2 teams randomly, but still working together to eliminate The CopyCats. There will be confusion between Humans because some Humans will see different Topic. Thus, Humans must place their trust on other Humans! * Hints provided don’t consistently relate to the actual topic word/phrase in the same way. Sometimes, a hint will be a word or phrase that can be described in a similar way as the topic, while being very unrelated. Illustrations for The CopyCat card game by Shaun Ellis ©.